This book was first published in 1969. Its author, David Crystal OBE, has since written some of the most important books on language and linguistics, including the Cambridge Encyclopedia of Language (1987) and the Cambridge Encyclopedia of the English Language (1995, 2003). Here, he provides the reader with a thorough and fascinating analysis of the patterns of intonation and prosody found within the English language. Crystal begins by contextualising his work on prosody within existing studies, before going on to discuss voice quality and sound attributes in prosodic systems. There are also comprehensive studies of the grammar, semantics and intonation of the spoken English language. 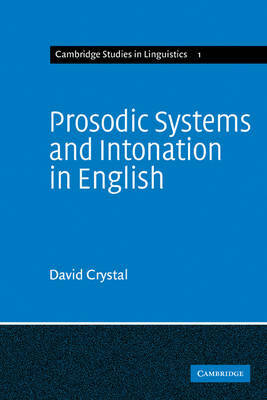 This book provides a useful theoretical base for the study of language, prosody and intonation, and will be enjoyed by all with an interest in linguistics and speech patterns in general, and in the academic works of David Crystal more specifically.